Salvation And Survival: What Does It Mean To Be A Part Of God's Remnant? What Does It Mean To Be A Part Of God's Remnant? You've often seem me write and refer to the remnant of God's Church on earth. But what does that mean, and what significance does the Bible give to this term? According to the dictionary, remnant means "a small remaining quantity of something; a surviving trace". The dictionary even gives a definition as to what the word means in Christian Theology: "a small minority of people who will remain faithful to God and so be saved (in allusion to Biblical prophecies concerning Israel)." 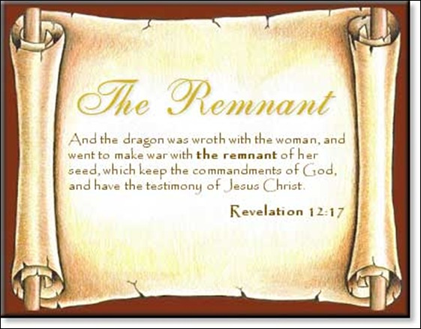 In this manner, the only time that I have seen Jesus refer to "the remnant" is in Matthew 22:6, as it pertains to the Wedding Feast: And the remnant took his servants, and entreated them spitefully, and slew them. In this instance, He is indeed, alluding to Israel who slew the prophets God sent to them to reveal His will that they might glorify Him among the nations on earth. This truth is attested to by the first appearance of the word, remnant, in Genesis 45:7-8 when Joseph said to his brothers who had sold him into slavery, "And God sent me before you to preserve for you a remnant on earth, and to keep alive for you many survivors. So it was not you who sent me here, but God." But even though "the remnant" refers specifically to a minority of the Israelites that God destined for His purpose, we in the Christian Church are grafted into God's promises to the Israelite remnant, if we have been called to demonstrate His power and glory to a skeptical and unseeing world (and Church). And it is indeed God who has brought us to this point, for the purpose of God's remnant, whether Jewish or Christian, never varies ... they are used to speak His Truth to His people, revealing a timely Word for the particular season they have been called. And since I am writing to a largely Christian population, I am attempting to impart the significance of God's remnant within the Western Church and the implications of their calling. To begin, the remnant may look different than you might expect. They are not perfect, and often include those who are relegated to the sidelines by Church leadership. They are often those injured by the Church. They just don't seem to fit in. And they can be the meek as well as the outspoken. 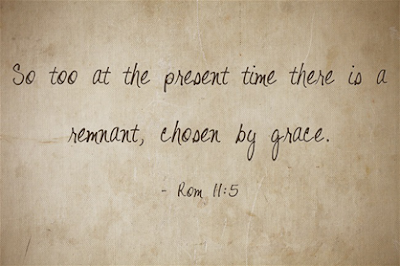 The point is that the Remnant doesn't choose their role, but are chosen by God through an encounter with Jesus and the Holy Spirit. It is not His desire that they be seen as separate from His Church, but rather to be the conscience of the Church as they seek to speak into the heart of Believer's and call them to repentance and obedience to the fundamental Truths of God and His Word -- Truths that very often, are no longer understood or practiced by the established Church. It is a sad fact that the Remnant shouldn't look any different, at all, from the rest of the Body of Christ! But it is a testament to the state of the Church that they do. Keeping in mind that we are all part of one Body; and members of that Body with different functions according to the gifts given to us by God's grace, then what is the role that God is calling the Remnant to undertake? From my humble perspective, I see that the Remnant of today's Church is being guided by the Holy Spirit to cause a revival and hunger among the Body to seek the Kingdom of God first -- just as Jesus commanded, and instead of remaining mired in doctrine, religious practices, and comfortable theology. In essence, the Remnant will find themselves taking the brunt of the Enemy's attacks because they are a threat to Satan's kingdom here on earth, as well as the brunt of the Church, itself, as it struggles against new revelation that threatens its status quo. In other words, the Remnant will find themselves positioned on the front lines of the Body of Christ as they partner with the Lord to take back territory for Heaven's Kingdom on earth. In addition, the majority of the Church will be happy to let the Remnant be "the tip of the spear" while they remain safe and comfortable at the rear of God's army -- even to the point where they will disapprove of where the Remnant is being led by Christ, Himself. The Church might see themselves as "Christian soldiers", but they never enter the battle. So, if you identify with that forward guard of the Church, let me suggest how you came to be called to this position. First, I would suspect that you had a stirring in your spirit that there was "something missing" in your experience as a Christian. You wanted more, and it was nothing that this world could offer you. You found yourself seeking more of God on your own because your spirit was hungry for regeneration and revival. Your prayers became more powerful and deeper in their urgency and desire for the Lord. It became important to you to hear God's voice, and your time in His Word revealed new concepts of His Nature and His call upon your life. What's more, you actually believe all the promises in the Bible as to your power and authority! You know that spiritual warfare is real and that Satan and his demons really exist because you literally engage in battle for the Kingdom. You know what it means to practice discernment and intercession. You know that the Church must be revived and enter into a new understanding of the full counsel of God's Word -- not just the politically correct, watered down version that leaves your fellow Brothers and Sisters locked in an immature, powerless faith and unable to reach a lost world. You sense that our time is running short and you desperately try to drag the Church into the destiny God has planned for them; speaking boldly with urgency and heartfelt compassion, that no one [whether in the Church or out] miss the true Gospel Message of repentance, prayer, and obedience... yet, you are often misunderstood and isolated. But take heart! You have been called by the Most High God for such a time as this! You know who you are! You are not anti-Church, nor do you want to be separate from the Church, but you are passionate about seeing the Church step into their true identity and the power that Jesus assigned to us. You long to see the Church rise up in revival and transformation to share the Gospel of the Kingdom as our Lord modeled for us and commanded us to do. And you also realize that Scripture tells us Jesus warned of the "luke-warm" nature of the Church in the Last Days. And He has called you to stand, just as He did Jeremiah, who declared, ...if I say, "I will not mention Him or speak any more in His name," His word is in my heart like a fire, a fire shut up in my bones. I am weary of holding it in; indeed, I cannot" (Jeremiah 20:9). You will find yourself in the position of Ezekiel, whom God told, "You must speak my words to them, whether they listen or fail to listen..." (Ezekiel 2:7). So, my friends, if you identify as a part of God's Remnant, then I would say you're in pretty good company. Count it all joy as you partner with Jesus and the Holy Spirit. Go forth, boldly and confidently, knowing that this is the path you have been called to walk. Rejoice in your mission, and draw strength and encouragement from your fellow sojourners and your Lord, who also experienced obstacles and disappointments on His way to glorifying the Father. For there is no greater calling this side of Heaven. Walk in Victory, for it is ours from the Lord. Isaiah 58:12 "And your ancient ruins shall be rebuilt; you shall raise up the foundations of many generations; you shall be called the repairer of the breach, the restorer of streets to dwell in". Thank you Pam for this encouragement. I've attended a Baptist church "every time the doors were open". I'm rather quiet, but recently the LORD has lit a fire within me to see HIS word in a different light. I have been excited to see Scripture open up. Unfortunately this excitement is not shared by most in the church. I am considered "outside the camp". But with prayer and the leading of the HOLY SPIRIT, I will serve and be counted with HIS remnant. We have a responsibility. We serve an AWESOME GOD! Thank you for commenting! And, sadly, I hear your experience echoed by people throughout the denominations of the churches in the United States. But we cannot look back, or to our fellow church members. We must continue to look up to our Father and Jesus in Heaven, and inward to the voice of the Holy Spirit, as They share the purpose of our awakening. We must continue, in love, to share with others what is being revealed, and never waver from our obedience. Just remain true to your calling, and God will use it for His good, perfect, and acceptable will for those who believe. Bless you and continue to stand! Thank you so much for this teaching. ALL of this fits me to a T! Wow! I have been completely blown away. Learning more and more what my purpose and destiny is on the earth.....Remnant of God.